#startyear to #endyear which is equivalent to a change of feet in 100 years. The plot shows the monthly mean sea level without the regular seasonal fluctuations due to coastal ocean temperatures, salinities, winds, atmospheric pressures, and ocean currents. The long-term linear trend is also shown, including its 95% confidence interval. The plotted values are relative to the most recent Mean Sea Level datum established by CO-OPS. The calculated trends for all stations are available as a table in millimeters/year and in feet/century (0.3 meters = 1 foot). If present, solid vertical lines indicate times of any major earthquakes in the vicinity of the station and dashed vertical lines bracket any periods of questionable data or datum shift. The figure will help to assess which scenario(s) the trajectory of sea level rise is following as well as the magnitude of year-to-year variability. A study on patterns and projections of high tide flooding shows the rise in local mean sea level will increase the annual occurrence of high tide flooding. The figure shows the station's annual mean relative sea level with its six regionalized sea level rise scenarios plotted relative to a 1991-2009 baseline period (i.e., year 2000 is the 'zero' for the figure) as described in the report on Global and Regional Sea Level Rise Scenarios for the United States. The plot shows the interannual variation of monthly mean sea level and the 5-month running average. The average seasonal cycle and linear sea level trend have been removed. Interannual variation is caused by irregular fluctuations in coastal ocean temperatures, salinities, winds, atmospheric pressures, and ocean currents. The interannual variation for many Pacific stations is closely related to the El Niño Southern Oscillation (ENSO). If present, solid vertical lines indicate times of any major earthquakes in the vicinity of the station and dashed vertical lines bracket any periods of questionable data or datum shifts. The average seasonal cycle of mean sea level, caused by regular fluctuations in coastal temperatures, salinities, winds, atmospheric pressures, and ocean currents, is shown along with each month's 95% confidence interval. For local and regional comparisons,	the calculated average seasonal values for all non CO-OPS and CO-OPS Stations are available as tables in meters. Linear relative sea level trends were calculated in overlapping 50-year increments for stations with sufficient historical data. The variation of each 50-year trend, with 95% confidence interval, is plotted against the mid-year of each 50-year period. The solid horizontal line represents the linear relative sea level trend using the entire period of record. As more data are collected at water level stations, the linear relative sea level trends can be recalculated each year. The figure compares linear relative sea level trends and 95% confidence intervals calculated from the beginning of the station record to recent years. The values do not indicate the trend in each year, but the trend of the entire data period up to that year. Although the trend may vary with the end year, there is no statistically significant difference between the calculated trends if their 95% confidence intervals overlap. Therefore, the most recent calculated trend is not necessarily more accurate than the previous trends; it is merely a little more precise. If several recent years have anomalously high or low water levels, the values may actually move slightly away from the true long-term linear trend. The main effect of including a few more years of data is to narrow the 95% confidence intervals. 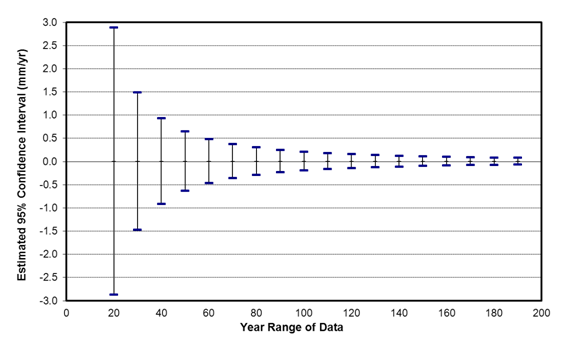 The figure below (from Sea Level Variations of the United States 1854-2006, NOAA Technical Report NOS CO-OPS 53) shows estimated widths of the 95% confidence intervals derived from all the calculated trends at long-term CO-OPS water level stations. A 30-year data set should provide a trend with a +/- 1.5 mm/yr confidence interval; a 60-year data set should provide a trend with a +/- 0.5 mm/yr confidence interval.